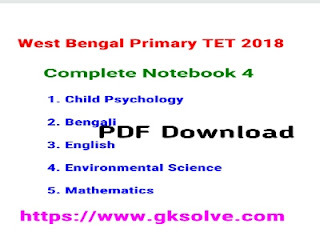 Primary TET 2018 Study Materials are available here. West Bengal Primary TET 2018 is coming soon. Most of the students are waiting for this Primary Examination. Important Study materials, Notebook, previous year question are available from our site. Study materials help you to better preparation. Today GK Solve share an important Notebook for you. 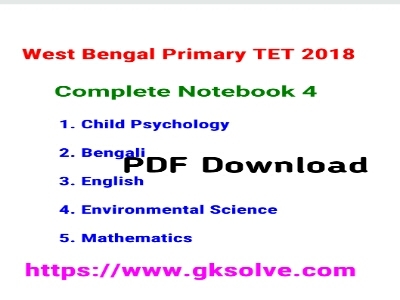 West Bengal Primary TET 2018 Notebook 4 download link available here. Details of Notebook and download link are are given below. You can download this pdf file just one click and also free of cost. In this pdf you can get some important question from Bengali, Child Psychology, English, Mathematics and Environmental science. So Readers are Requested to Download this pdf as soon as possible and start practice.